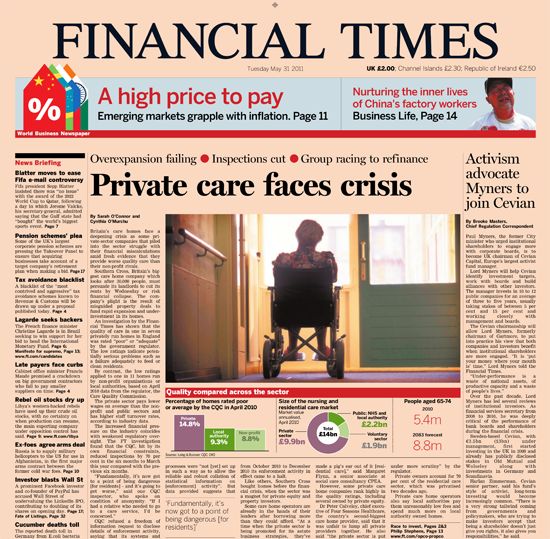 A Financial Times investigation into the private care home industry exposed how some private equity investors turned elderly care into a profit machine and highlighted the deadly human costs of a business model that favored investment returns over good care. The analysis was timely, because the financial problems of Southern Cross, then the country’s largest care home operator, were coming to a head. The government had for decades promoted a privatisation drive in the care sector and continued to tout the private sector for its astute business practices. Our inquiry began with analyzing data we obtained from the UK regulator in charge of inspecting care homes. The information was public, but it required a lot of persistence to get the data in a form that was usable. The data included ratings (now defunct) on individual homes' performance and a breakdown of whether they were private, government-owned or non-profit. The Care Quality Commission (CQC), up to June 2010, rated care homes on quality (0 stars = poor to 3 stars = excellent). The first step required extensive data cleaning, as the data provided by the Care Quality Commission for example contained categorizations that were not uniform. This was primarily done using Excel. We also determined — through desk and phone research — whether particular homes were owned by private-equity groups. Before the financial crisis, the care home sector was a magnet for private equity and property investors, but several — such as Southern Cross — had begun to face serious financial difficulties. We wanted to establish what effect, if any, private equity ownership had on quality of care. A relatively straight forward set of Excel calculations enabled us to establish that the non-profit and government-run homes on average performed significantly better than the private sector. Some private equity-owned care home groups performed well over average, and others well below average. Paired with on-the-ground reporting, case studies of neglect, an in-depth look at the failures in regulatory policies as well as other data on levels of pay, turnover rates etc, our analysis was able to paint a picture of the true state of elderly care. Make sure you keep notes on how you manipulate the original data. Keep a copy of the original data and never change the original. Check and double check the data. Do the analysis several times (if need be from scratch). If you mention particular companies or individuals, give them a right to reply.